It wasn’t always a trio. In fact, it started out with Bruce and Jane getting together and working on duets (which yielded the CD “Secret Code” MSK 146). They found that they had an affinity that kept them getting together and rehearsing and with the addition of a bass player, they started playing at the Bar Next Door, an intimate jazz hang in Manhattan’s West Village. Ms. Getter had tenured with the Saturday Night Live band, but it was working with the Hammond B-3 player Jack McDuff that jump-started her journey off the straight-ahead jazz path. "I realized that a big part of what I love about playing music was connecting with people, through groove,” she says. And although Arnold’s journey had led him through some of the most intellectually circuitous musical terrain (he has pioneered the use of 12-tone and pitch class set theory as applied to improvisation), his roots still went back to blues and rock. Here comes the twist: then Jane had the idea of a guitar trio, rather than 2 guitars and a bass. Her suggestion was to contact Alex Skolnick, to see if he would be interested. Skolnick may be best known as the guitarist from the Speed Metal band Testament, but he is also known as the guy who took a few years off to seriously study jazz. He now fronts his own jazz trio, and works on a diverse number of projects --all while still touring internationally with Testament. And he was definitely interested in playing with Bruce and Jane. It might seem like an unlikely combination, but the only real surprise is how well it all worked. The musical teamwork was there. After one session at the Bar Next Door, Bruce decided to videotape the next gig. “The Firelight Concert” is the DVD of that gig. Low lights, tiny room and all. It was one of those great New York nights, where you can walk into a low profile place and catch the best players around, just doing an intimate fun night for a couple of friends. We think we caught that. And we promise you won’t miss the bass. 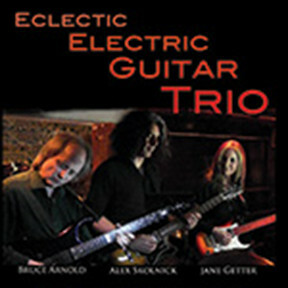 Get The Eclectic Electric Guitar Trio DVD...today!